Brendan Doyle is a twentieth-century English professor who travels back to 1810 London to attend a lecture given by English romantic poet Samuel Taylor Coleridge. This is a London filled with deformed clowns, organised beggar societies, insane homunculi and magic. When he is kidnapped by gypsies and consequently misses his return trip to 1983, the mild-mannered Doyle is forced to become a street-smart con man, escape artist, and swordsman in order to survive in the dark and treacherous London underworld. He defies bullets, black magic, murderous beggars, freezing waters, imprisonment in mutant-infested dungeons, poisoning, and even a plunge back to 1684. Coleridge himself and poet Lord Byron make appearances in the novel, which also features a poor tinkerer who creates genetic monsters and a werewolf that inhabits others’ bodies when his latest becomes too hairy. Why did I read this book: It appears in pretty much ALL Steampunk Essentials list. I had to read when we decided on a second Steampunk week. Oh, look, there is an elephant in the room. Let’s get this thing out of the way first: what prompted me to read The Anubis Gates is its presence in many lists of Steampunk essentials. After reading it, I am completely baffled as this book is not by any stretch of imagination, a Steampunk novel. For starters, there is not a shred of science (or Steam) in the book nor there is any Punk – although there is a look at poverty and there is plot to remove the King, these are not subversive enough. I have seen some mentioning that what deems it Steampunk is the fact that 1) it is set in Victorian times as most Steampunk and 2) there is time travel. With regards to the former: er, no. NO. The Anubis Gates is not set in Victorian times. The story takes place in 1801, 1810, 1983 and the 1600s. None of those are Victorian. The Victorian period starts in 1837 when Queen Victoria came to the throne. The fact that a book is set in the 19th Century does not automatically make it a Victorian novel. This one in particular is set in Georgian times, pre-Regency and if the date does not give a hint, the fact that the premise of the book is based on a plot to kill KING GEORGE, should be enough. Here ends the History rant. As for the latter, the time travel is not done by any Scientific means but by magic which to my mind, firmly sets the novel within the Fantasy genre rather than the SciFi-ish Steampunk. And, now that the elephant is out of the way, I can say: and what a glorious Fantasy novel this is. Back in the early 19th century a group of Gypsy magicians prepares to bring down the British Empire and restore freedom to Egypt by unleashing the power of Ancient Egyptian Gods. Their attempt fails and magic gates end up opened across time and space as a result. In 1983, Brendan Doyle is a literary scholar who is hired by a millionaire J. Cochran Darrow, who discovered a pattern in the gates and means to explore them, to be the guide of a group of well-off clients back in time to attend a lecture by famous poet Coleridge. Doyle is excited about the trip not only for the opportunity to see Coleridge in person but also for the chance to find out more about obscure poet William Ashbless who is to be the subject of his next book. The tour goes well to start with but Doyle ends up missing the return trip when one of the magicians, a Dr Romany, kidnaps him after witnessing their jump to his time. Doyle flees the guy but ends up stuck in 1810 and that’s when his adventure truly starts. Beggars, creepy clowns, kas, a werewolf who jumps from body to body, a girl dressed as a boy to seek revenge, a trip to the 17th century and back, all of this and more are present in an almost flawless story. It doesn’t start off smoothly though. Yes, a little suspension of disbelief is required to start with. Weird as it sounds, it is easier for me to buy the time travel based in magic than to buy that for example, a couple of literary types can afford it. Not with Darrow charging upwards to a million dollars for it. It was also difficult to understand how blasé Doyle was about the whole time travelling and his role in it. And here lies my main problem with the novel : the main character. Doyle is never truly fully realised, in a three dimensional way. For most of the book, he comes across as a non-entity, a boring, passive fellow who doesn’t even have a moment of real fury about being stuck in time. Although some of it is deftly handled as Doyle thinks he will do mighty well because of 20th century “advantage” of knowing what is going to happen or when and then meet people and suggest a few inventions (light bulb, flush toilets, etc). He even muses about the dangers of altering the course of recorded history . He is the time traveller who knows the tropes of time travelling. But ironically, Doyle has a hard time adapting and he discovers things are not that easy. There are some small moments of genius in Doyle’s character and the (awesome) ending, for example does more for the character than the entire book. Plus I really like some of the absolutely great secondary characters such as Jacky (the girl dressed as boy living as beggar) or the creepy Horrabin, leader of a group of organised beggars – who is a mixture of Fagin and Moreau. Flawed as it is, in my opinion, when it comes to characterisation, The Anubis Gates is truly and deeply a plot-driven novel and plot reigns supreme here. Anyone who is remotely familiar with time travel stories will know that there is always and forever, a certain degree of predictability. We all know, when we are reading about someone time travelling, that something is going to happen to alter story or history somehow. Here, one of the main twists is even very clearly foreshadowed from the get go. But to those in the know, the cool thing is to see “how” everything ends up happening the way they do. And I can only say that Tim Powers does it brilliantly here – even with all the foreshadowing, any predictability goes out of the window pretty soon and we are surprised with many twists and a-ha moments when everything comes together in a very tightly woven plot. 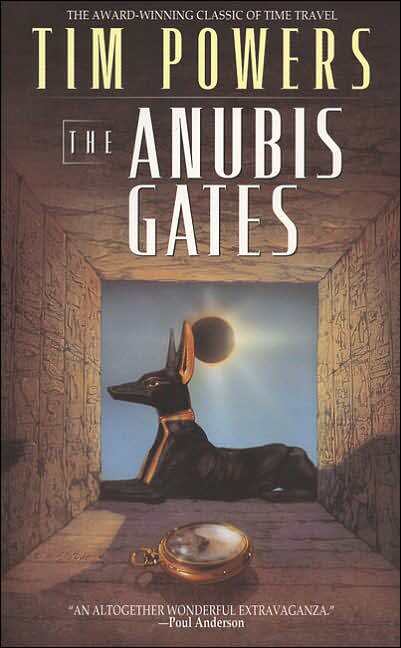 The Anubis Gates is definitely an excellent novel, well-paced, fun, and very well written. It is just short of being a truly awesome, perfect one because for the majority of the time I spent reading it, I cared only about what was happening not about what was happening to the main character. If you like plot-driven time travel novels, you can’t possibly miss this one. BUT IS IT STEAMPUNK? Absolutely NOT and I can’t stress this enough. As I said in the intro, the driving force behind the time travel is magic, not science or technology. There is no out-of-time technological advancement, no steam, no punk, no true steampunk element to call this a Steampunk novel. It is a great Fantasy (with a few elements of horror) novel, though. Notable Quotes/ Parts: there is one a-ha moment in particular that turned the book to me. Until that moment, I was merely enjoying it, then it became “read or die”. Additional Thoughts: This was my first Tim Powers’ novel and I don’t want it to be the last. Any suggestion as to which I should read next? Verdict: An absolutely great, fun, time travel story. I could have done with more character development but in the end it didn’t matter too much. It is easy to understand how this is a Fantasy Masterwork (tm Gollancz) . Reading Next: Steampunk edited by Jeff and Ann Vandermeer. Last Call is probably the best Powers novel. Read that. It’s about Vegas and the tarot and the Fisher King myth all at the same time. It is amazing. Earthquake Weather and Expiration Dates both spin out of Last Call, even though each stands alone. Declare and 3 Days To Never are both espionage stories filled with Powers’s quirkiness. They are not connected; each is a standalone. They are good, but not as good as Last Call. I *love* this book. Your criticism of Powers’ characterization is reasonable; you’re right, his plot arcs are what keep you glued to the pages. You might like The Stress of Her Regard, which I believe is out of print, but as a unique take on vampires (they’re made of stone!) it’s well worth the time required to find it. I’d also recommend Last Call, which combines Las Vegas, poker, tarot and the Fisher King myth in a fascinating way. His latest novel, Declare/ is another one that had me racing through pages at the end to find out what happened. The guy is amazing. Also, Of Stranger Tides is being adapted as the next Pirates of the Caribbean movie. I suggest reading Declare or Last Call next. They are the best Powers books I have read so far. The Stress of her Regard has been reprinted by a small press, but it is in my TBR pile so I can’t say how good it is. I just finished On Stranger Tides, which was lots of fun with pirates and zombies, but the plot wasn’t as complicated as I had expected from reading Last Call and Declare. Then I realised On Stranger Tides is one of his earlier books. Powers books definitely get more complicated and awesome as he gets more experienced. Can’t wait to see what he writes next! Tim Powers is one of my favorite authors, and Last Call is one of my favorite books. So my recommendation would be to read either Last Call or The Stress of Her Regard (another favorite, because I’m a total poetry nerd) next. 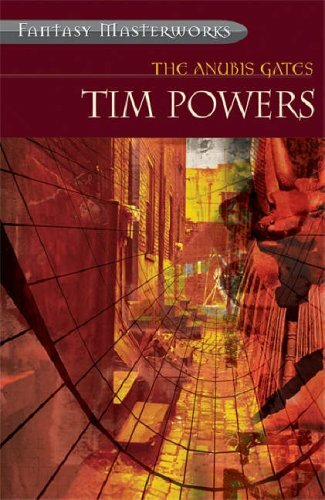 Tim Powers is a wonderful author, and Anubis Gates, my copy long dog eared (no pun intended) and creased, has been re-read many times in my youth. All of the recommended books are of course tops, but I’d also suggest if you enjoyed TAG to make sure to read The Drawing of the Dark. Simply a great book, and fine place to start with his work. Finally, I’m not so sure I agree with your critique of his main character. I always read that you were supposed to find him a bit unlikable and pathetic. That’s part of the joy watching him be so terribly out-maneuvered and what he suffers is truly wrenching and for Doyle, life and character changing in the most literal way possible. All in all, I think it’s a very subtle trick of transformation and quite intentional on the author’s part. We’re supposed to find him a hard character to like or even root for, until he’s suffered so much and made so many bad choices we finally feel like he deserves a break after so much ill use. Anyway, a great book, but I too can’t for the life of me see any connection to Steampunk. Read The Stress of Her Regard! It is fantastic and recently back in print in QP with a beautiful cover. Thanks for all the suggestions! I wil try Next Call! I meant Last Call, next. Zoe, but it just doens’t make any sense. The quote you include alove proves that this book is NOT Steampunk: it is not a Victorian fantasy nor does it have an TECHNOLOGY. At all, nada, nothing. I think that his point in mentioning steam technology wasn’t to say that it had to be portrayed in the novel as better-developed than it actually was, or had to be a focus of the whole thing. It’s just a reference to the background technology of the whole period. In real-life history (so wikipedia tells me), the period of industrialization between around 1770 and 1914 was referred to as the Age of Steam. I have to say, I think the focus on Victorian is just nit-picking. If there were a more traditional technology-focused “steampunk” book set in the regency period (gasp! the horror), would it really have a vastly different feel from one set in Victorian times, to the extent that it should be excluded from the genre? Hi Zoë – though the general consensus for time period for the steampunk subgenre is Victorian, I do agree that we shouldn’t be too stringent in applying this as a make-or-break criterion to determine whether or not a work is steampunk. I think what Ana was trying to clarify is that by her definition, the technological aspect is key. Victorian, Edwardian, Regency, whatever; the specific time period is not so important so long as the work derives from the steam-tech aesthetic and the technological aspect is central to the story. Then it’s steampunk. And THE ANUBIS GATES, while a wonderful novel, does not fit that definition because it neither features the central technology, nor is it set during (or have the aesthetic of) the Victorian period. Right, I just thought it might be worth mentioning in among the “It’s not steampunk!” discussion that the term steampunk was invented with this specific book in mind. So I don’t think the steampunk designation is baffling or wrong; the meaning has just changed over time. Likewise, this book isn’t included in all the steampunk lists just because people keep making mistakes, but because it actually is a fundamental work of steampunk in the original sense of the word. Oops, forgot my name in the comment above. Zoe – Thanks for bringing it up. But I still mantain my argument, because the book does not fit the genre EVEN by K.W. Peter’s own definition (the one you quoted). Which I agree, might sound crazy, but that is just how I see it. I love fantasy so I’ll check this book out. Thank you! My favorite Tim Powers book is The Drawing of the Dark – absolutely wonderful. Atypical characters, dry humor, mystery, mythology, swashbuckling, and beer. What more could you want? Great articles on steampunk here. Thanks so much for Steampunk Week!